I don’t plan to move from Maryland anytime soon. I could not have said that until seven years ago when my husband retired from government service. Moving was nothing new to me, as an “Army brat” who moved about every two-three years while growing up. My father’s career took us back and forth across the Atlantic several times, so I was blessed to have lived in France, Germany and Italy, in addition to several US states. My husband’s career took us to 6 different countries in Latin America. I tell people that our family didn’t take vacation trips much. We just moved every few summers! I found stability in Catholic church communities. My father was Catholic, my mother Presbyterian. My sister, brother and I went to Sunday Mass with Dad, while Mother found “quiet time at home to spend with the Lord.” I was baptized at Ft. Benning, Georgia, received First Communion in Annandale, Virginia, and was confirmed in Paris, France. I, like many of us, dutifully attended CCD classes. In my junior year of high school, living in Heidelberg, Germany, I joined the Catholic youth group on an overnight train, bound for Rome. We were greeted by North American College seminarians, who hosted our group for a week’s worth of sightseeing, praise and worship, delicious dining, and Masses in the Catacombs. I was hooked on this wonderful faith ride! I returned on these trips for the next 2 years, growing ever so more deeply in love with Jesus. We moved two more times after that: to Ellicott City, Maryland, then to El Paso, Texas. 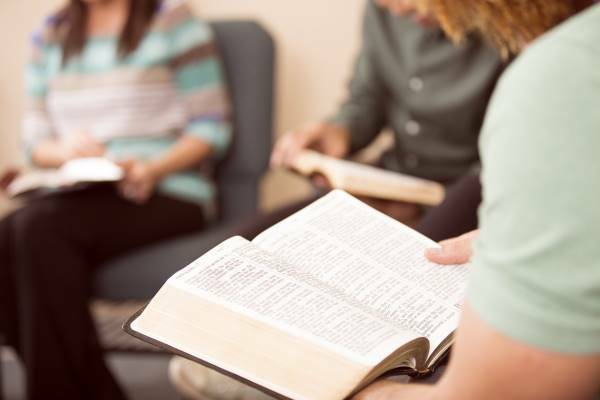 In both places, I sought a Bible Study group to join, and not finding one in my local parish, I started one. I was able to earn a theology certificate from Tepeyac Institute in El Paso, and the more I learned, the more I realized how much more there is to learn! The “Faith Sharing Group” in El Paso, with both men and women, still continues, 7 years after my departure. A priest once told me that the goal in ministry is to be “fired” from one’s job − meaning that a leader steps forth from within the group! The study group I facilitate now has been together for about 5 years. It was a great way for me, as a newcomer, to get to know people in the parish. We have a core group of about 12 “regulars,” who have been together since the beginning, and there are new faces who come with each new study. We read the assignments during the week, and when gathered in class, prayerfully discuss the study questions, and finish with the DVD lectures. We share our lives, open our hearts to supporting one another through joys and sorrows, as we learn and grow in faith. The LRSS format facilitates familiarity with the unfolding of salvation history through the life of Jesus. When we hear the Word proclaimed at Mass, we now better appreciate the message within the culture it was written, and learn how to apply it to our lives. In Evangelii Gaudium, Pope Francis begins, “The joy of the Gospel fills the hearts and lives of all who encounter Jesus.” Studying Scripture leads to bearing the fruit of this encounter: mercy, compassion, outreach and community. Our groups have helped feed and clothe the less fortunate, and have served others in sister parishes. I feel overwhelmingly blessed by the wonderful people God has allowed me to encounter along the way, and to witness a growth in Scripture Study interest. Although I enjoy starting new Bible Study communities, and hope to see more leaders called forth, in these golden years, I hope that I don’t have to move again anytime soon! Christina M. Delaney lives near Annapolis, Maryland, where she is learning how to live as a recently bereaved parent, but still finds joy in Scripture Study and spending time with her husband, surviving children and grand-twins. Coming next month – a new volume of Alive in the Word! Dinah Simmons, a writer and parish minister from Halifax, Nova Scotia, uses her theological training and love of Scripture to help us appreciate Mary Magdalene: Apostle to the Apostles. Make plans now to gather a group and spend time with the woman who traveled with Jesus, learned to be his disciple, and then experienced his resurrection in a profound and personal way. We want to hear from those of you who are studying Luke using the new edition of our study materials. How is it going? What can you share with us about your group’s experience? Are you making use of the free lectures for each session online? Give us a call at 501-664-6102 or write to us at lrss@dolr.org. © Copyright 2018 Little Rock Scripture Study, Little Rock, Arkansas. All rights reserved.